According to ESPN, Toronto Blue Jays catcher Mike Napoli was traded Tuesday for the second time in four days. This time, Napoli will rejoin the American League West, as he was traded to the Texas Rangers on Tuesday, January 25, for relief pitcher Frank Francisco and cash. “The 29-year-old Napoli had been acquired by Toronto along with outfielder Juan Rivera from the Los Angeles Angels of Anaheim for outfielder Vernon Wells on January 21. The right-handed hitter batted .238 with 26 homers and 68 RBI in 140 games with the Angels in 2010, his fifth season with the club. Napoli set career bests for games, at bats (453), hits (108), doubles (24), homers, and RBI. 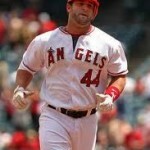 He led the Angels in homers and slugging (.468), tied for fourth in doubles, and ranked fifth in RBI. Napoli also batted a team best .305 (43-141) vs. left-handed pitching.” See the full story here on espndallas.com. The story is newsworthy for multiple reasons. First off, as stated before, Napoli is coming off of one of the best seasons of his career. Secondly, he adds much needed depth to the Rangers’ catching staff. Last season Texas aquired veteran catcher Bengie Molina, who helped it reach the World Series with his ability to handle its pitching staff. But the Rangers decided not to re-sign the 36-year-old catcher, so Texas’ three other catchers will compete for the back-up spot on the opending day roster. Napoli, with his good track record as a catcher in Los Angeles, will most likely be expected to some what mentor the Rangers’ other catchers. Since Napoli can also play first base, the other catchers, Taylor Teagarden, Yorvit Torrealba, and Matt Treanor, will most likely compete for two spots in Texas’ lineup during spring training. All three catchers saw playing time last season and all showed promising signs for the future, so the competition should be great once the team reports to camp. Check out the Rangers’ current 40-man roster to see the situation yourself. The story also makes a good news story because it is interesting and current to the fans. It also impacts one of baseball’s top catchers so it is prominent as well. The fact the Napoli has been traded twice in a span of four days makes for an interesting story itself. And the fact the he is going back to the same division (AL West), where he spent most of his previous playing days, makes the story even more interesting. I believe that most fans, along with myself, are excited to see what Napoli can bring to the table in Texas when he and the rest of his new teammates report for spring training next month. This entry was posted	on Wednesday, January 26th, 2011 at 12:17 pm	and is filed under Trades. You can follow any responses to this entry through the RSS 2.0 feed. Both comments and pings are currently closed. Powered by WordPress v 4.9.4. Page in 0.224 seconds.